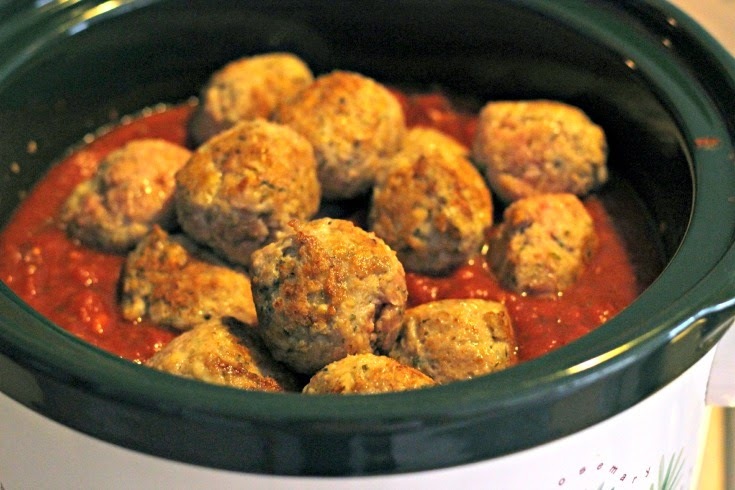 No fuss homemade turkey meatballs in a rich tomato sauce simmered all day your slow cooker! This classic recipe is a keeper and one I'm happy to share with you today from my friend, Sarah Olson's new cookbook, The Magical Slow Cooker. I am so excited to review Sarah's cookbook with you! 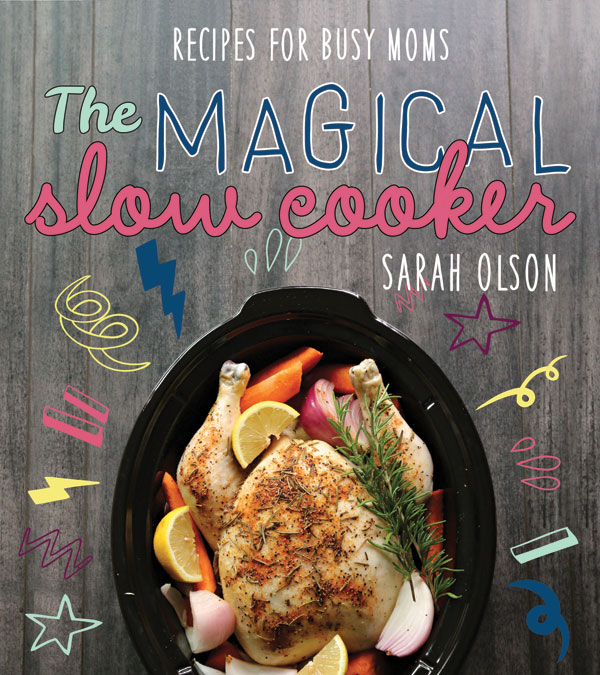 I've known Sarah for some time now and have always been a fan of her blog The Magical Slow Cooker and the wonderful creative recipes she shares there, but things just got a whole lot more serious with the publication of her first cookbook, The Magical Slow Cooker. When Sarah asked if I wanted to review her cookbook, I jumped at the opportunity and said YES! YES! YES! After reading the book from cover to cover (because, yes, that is how I read cookbooks! 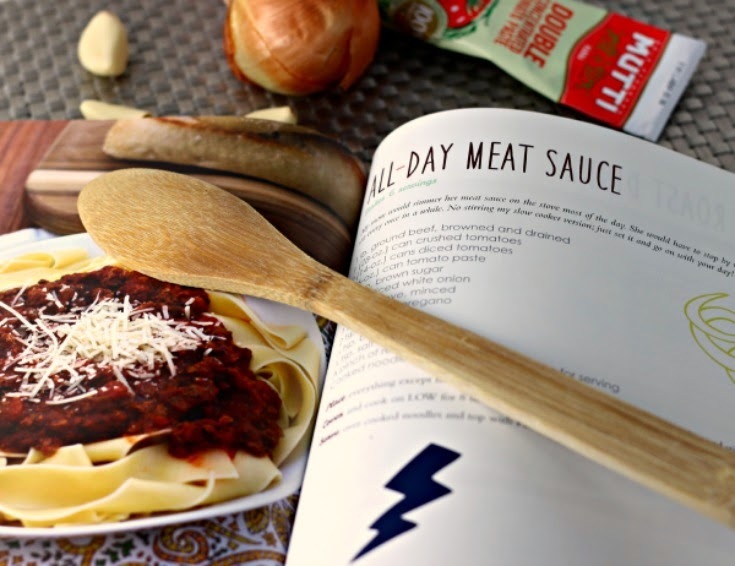 ), I settled on making a version of her All-Day Meat Sauce (pg. 131). I decided to swap out the ground beef in the recipe for some homemade turkey meatballs, but kept all the sauce ingredients as written. This really was the perfect recipe to make on the day I chose to prepare it. It was a day I had to be gone most of the day, so I wouldn't be home to slow cook anything on the stove. All I needed to do was a little prep work in the morning, and I returned home later that day, to a house filled with the wonderful aroma of a homemade Italian feast. Seriously, not much smells more inviting then homemade tomato sauce that has simmered all day long. To get dinner on the table, all that was left to do was boil up some pasta and toss a quick green salad together, and dinner was served! I made homemade turkey meatballs here, quickly browned them up stove top and then added them to the sauce, but I don't see why frozen prepared meatballs wouldn't work just as well, and be even more of a time saver! The sauce was delicious and I will definitely be making this recipe again and again. It was so nice to return home to an easy meal, that was better than any jarred sauce I could buy. For more information on Sarah's cookbook, The Magical Slow Cooker, visit Sarah's blog, The Magical Slow Cooker, where she's linked all the sites and stores you can purchase it from and discover why your slow cooker really is magical! This cookbook is a valuable resource for any busy mom or anyone who likes to have homemade, healthy meals on the table with little fuss. Classic meatballs and tomato sauce, made lighter with ground turkey and easy by simmering all day in your slow cooker! 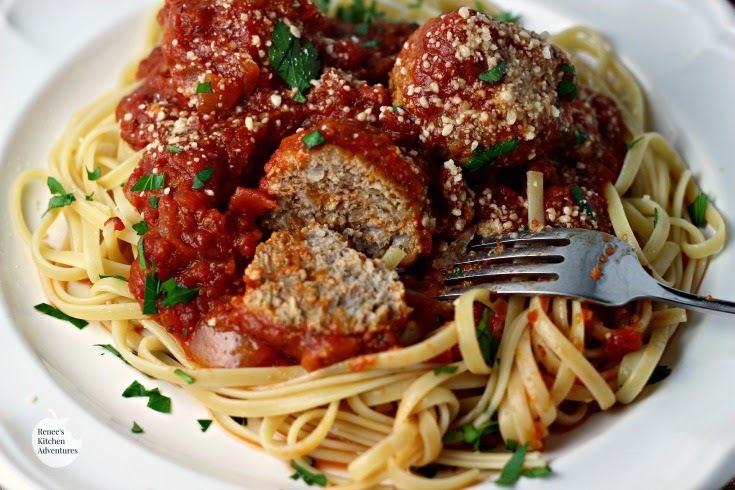 Make the meatballs by combining all meatball ingredients except olive oil in a large bowl. With a small ice cream scoop, form into meatballs. Heat large skillet over med-high heat and add olive oil. Brown the meatballs on all sides, but do not cook all the way through. (about 5 minutes). Remove meatballs to paper towel lined plate and set aside. Add all ingredients for sauce to a 6-quart slow cooker and stir. Add in the browned meatballs and stir. Cover and cook on LOW for 8 hours without opening lid during cooking time. Serve over cooked pasta and garnish with grated Parmesan cheese. This would also make awesome meatballs subs! Using the slow cooker is a great way of combining all the flavors, I like it. I agree!! And its so easy to get a healthy meal on the table when you are strapped for time too! I've never been a huge meatball fan, but these ones sound really great! and I LOVE slow cooker meals! The slow cooker really does make it easy! Your meatballs with the sauce sound perfect! Thank you for the book review! I really appreciate it! It was my pleasure! Thanks for the opportunity! Slow cooked sauce is a great meal to come home too! Great idea to add the meatballs right in the sauce. Sarah's recipes are great. Now I'm anxious to try this recipe! The meatballs in the sauce worked out great! Looks absolutely delicious! I need to try this particular recipe out also. I agree, reading her cookbook has opened my eyes about what you can do in the slow cooker! Thanks! I know, it's crazy how much you can make in the slow cooker! These meatballs look amazing! I really need to go ahead and order my copy of Sarah's cookbook from Amazon. :) I LOVE my slow cooker. 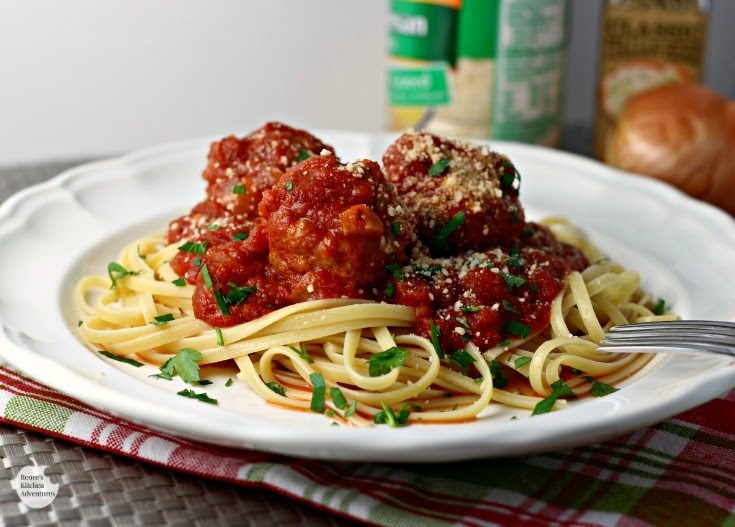 What a great idea and a delicious recipe, we will love your Turkey Meatballs. Thanks so much for sharing with Full Plate Thursday this week and come back soon! Fabulous recipe! I love Sarah's cookbook..I am working my way through it now!